At the start of the month we held the third annual Bugeater GT at Millard West High School. It was another successful year overall, raising thousands for the debate team while at the same time allowing gamers to have a great weekend. In an effort to kick start my blogging and get my posts up I wanted to share my thoughts on the tournament: what our goals were, what went well, what we could have done better, etc. (If you have no idea what the Bugeater is, I’d recommend visiting the tournament page here). Coming in to the third year of running the tournament, we had one rather large goal and two smaller goals. The large goal was to really improve the operations of the tournament. The feedback we got from the players in the first two years was overwhelmingly positive, but we just about killed ourselves behind the scenes running the tournament. In year two in particular, where we added nearly forty additional players, we stretched ourselves to the max. There were three or four guys in particular that had WAY too much to do, and were at their wits end. With the understanding the first year we were just figuring out how to do the event, and year two had growing pains, we wanted year three to be a smooth operation. We wanted to make sure that someone had one, maybe two responsibilities max (we had a couple of guys last year that did set up, tear down, rules judging, paint judging, and ringing all in the same weekend … that’s waaaay too much). I made sure the set up / tear down crews didn’t do anything during the tournament, and I made sure my tournament staff didn’t have to do anything before or after the event. Rather than caravaning the materials to the school with six or seven cars making three trips to the the different sites that hold our stuff, we rented a U-Haul and just did one trip to the three sites and got it all to the school. 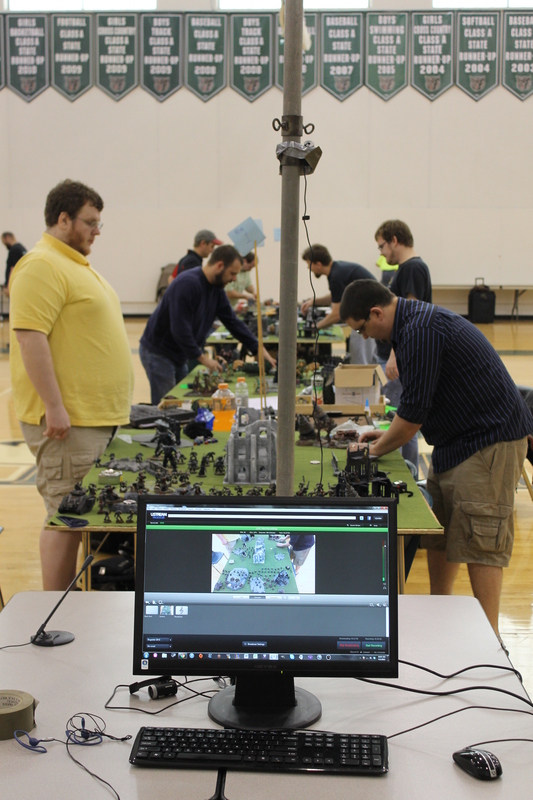 We used Warscore this year rather than just an excel spreadsheet to tabulate the tournament. Those are just some examples, but I think (we haven’t held our debrief meeting yet because of debate nationals, so I want to hear from the other tournament staff members before I say for sure) we were ultimately successful in having a better run, less stressful tournament for our staff. We actually had everything out of the school Sunday night for the first time ever, which was really nice. That major goal doesn’t really affect the player directly in too many ways, but probably the biggest area it helped out was running on time. Warscore is an amazing piece of free tournament software designed for warhammer tournaments, and it allowed us to handle several curve balls that got sent our way very quickly. We were only late on one round period (4ok round 2) the whole time, and that was because we had some late starts to round 1 and a couple of late finishes. That might not sound like a great goal to some, when there are some other issues we can work on (more on that later), but without the great local players that help run the tournament it wouldn’t happen. Period. And I feel it is important to take care of the folks that are willing to spend their weekend answering rules questions, judging painting, playing ringer, or spending three hours loading plywood onto a uhaul on Sunday night after playing in a two day GT. Now that we refined our behind the scenes, we have a solid framework going forward and we can focus on other things going forward. We were able to add live streaming of the games this year – but on Sunday only and only for 40k. So this is still a work in progress. 1) Add live streaming. I’d probably grade us a C- on this one. We have all the equipment we needed, but we got thrown some curveballs on Saturday and at the end of the day I preferred to focus more on running the GT than scrambling to get the webcams running. First – youtube for some reason took the livestreaming privileges off the account. We’re still not sure why this happened. We had a backup plan read (uStream), but before we could get past that we had a hardware issue. The staff laptops were all being reimaged, something we had not planned for, meaning I had no additional computers to install the broadcast software on so we couldn’t broadcast both fantasy and 40k – just one. As it stood we got the problem “fixed” on Sunday by bringing in my desktop and using it to stream the top 40k table. But unfortunately, because we used our backup on uStream the games didn’t record. This is something we’d like to do more next year. It is a nice little perk, especially since we’ll use our youtube account next and the games will record, so that way folks can go back and look at their games. 2) Expand Friday night. Last year we had some combat patrol, and open gaming … and that was about it. 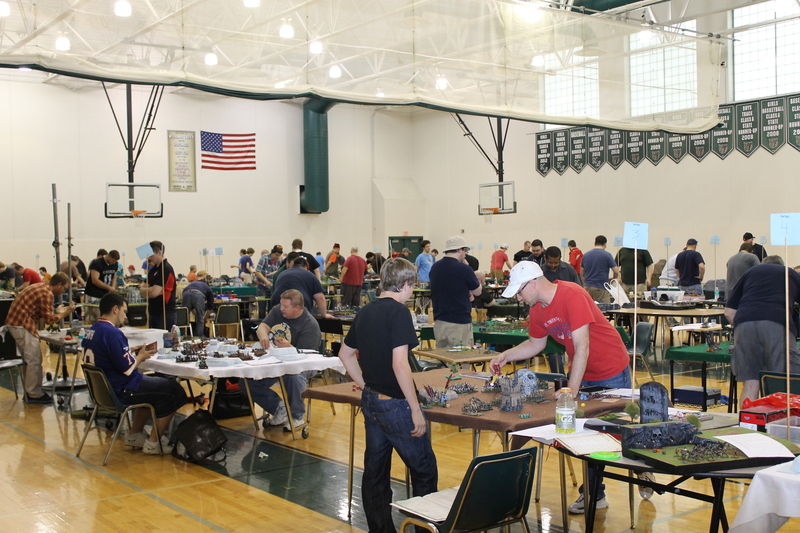 This year we had hoped to add three events: fantasy warbands, Battlefleet Gothic, and a fantasy mini team tournament. We didn’t have entries in the mini team tournament, and BFG fizzled out, but we did have quite a few play the warbands. We didn’t run warbands last year, so we allocated an hour of time per game which proved to be way too much – an easy fix for next year. So while some of our specific ideas didn’t pan out, warbands and combat patrol were successful and we had 50+ show up on Friday night. Our Friday night is still kinda haphazard, but more on next year’s ideas later in the post. I think there’s a lot we do well. I’m not saying that to pay myself on the back, but I genuinely feel that overall we produce a good tournament experience. A lot of that has to do with the players … one thing I hear every year is how awesome the gamers are at our event. Zach from the Independent Characters talked about that at length in his debrief episode last year, and I heard the same thing this year as well. Most of our stuff that went well we actually implemented in year two and just put ourselves in a holding pattern – things like having an empty table between game tables, having the debaters come around and ask for concessions, etc. Once again, we had AMAZING prize support and we were able to raffle away a lot of prizes. There really isn’t much more to say – with three years under our belt it is now clear that the core of tournament and the approach we take to running it works. We have survey data and blog reviews to back that up. The only real issue that stood out for 40k was table quarters. I already made a note of that in my internal log, and it was made clear in feedback forms and on blog reviews. This will definitely evolve for next year – the table quarter mechanic didn’t work too well by my standards. I think this happened for two reasons. First, we didn’t really do our job locally testing out the primer missions. We did a good job using the Khornehusker to test out the sixth ed book missions for determining integration into the Bugeater missions, but didn’t do a good job following up those integrated missions. Second, we posted the primer pack with the table quarter rules months ahead of time and had the grand total of ONE bit of feedback about table quarters (and that had more to do with why it should or should not be primary/secondary, not the mechanic itself). So for next year, I will make sure we do a better job of internally testing the missions. We are currently experiencing a little 40k renaissance in Omaha with a third gaming group sprouting up seemingly out of nowhere. With a more active local scene, hopefully we can have some better testing. Second, we’ll do a better job communicating out the primer pack and have some formal method of providing feedback to make sure we don’t run into some of the troubles with a mission mechanic like we did this year. The only real issue we had this year was terrain. We acknowledged it, but we wanted to dedicate a year to making better fantasy terrain and doing it right. Our 40k terrain is well known, and we want our fantasy terrain to be the same. There are some future issues that we have to work on though, and that largely centers around comp (more on that later). We had one big goof this year – we failed to release the painting rubric early for people to look at. There’s no real excuse for this, and it should have been sent out. Thankfully, that’s an easy fix for next year. The other issue isn’t really anything we can do about – day of drops. We sold out 40k, yet we finished with less than 60 players. The similar situation was true in Fantasy. There’s nothing we can do about that – no shows happen, and people have reasons to leave the tournament mid way through. But I would like to actually reach the number of players we budget for – so we might expand the number of spots knowing that there will be a certain amount of attrition that takes place. 1) Fantasy terrain. I want to undertake a massive effort to improve and our fantasy terrain and bring it up to 40k levels. 2) Change composition for fantasy. We had a special comp feedback sheet on the back of the fantasy survey, and the results were interesting. About half wanted swedish comp, and about half wanted no comp. Literally …. polar opposites. We will have some tough decisions to make. 3) Formalize / clean up Friday night. There are a lot of things I want to do with Friday. We might even make Friday a full day of events. But I’d like to offer one more late session of mini games for folks arriving late, do live draw for both 40k and fantasy, and have a more official early check in for folks. This does not mean there’s other things we should work on, those are just three I’d personally like to take a look at. Once our team has our meeting I will email out to all the GT attendees with my thanks for attending and a further summary of our thoughts and what we look forward to in 2014, but in the meantime please email me at RoyersT@gmail.com if you have any questions. Thankfully, now that the GT is done I have had time for hobby progress (although a week in Birmingham is about to delay that, haha)! We’re working on our team tournament armies for next year’s Adepticon, and I’ve been able to actually paint some models and work on some sweet conversions. But more on that stuff in future posts. Posted in GT Info, Omaha, Warhammer, Warhammer 40k and tagged bugeater gt, Warhammer, warhammer 40k. Click on the logo to visit the site for the Bugeater GT!